A generous friend, thanks Denise, gave me lab beakers to use for whatever. 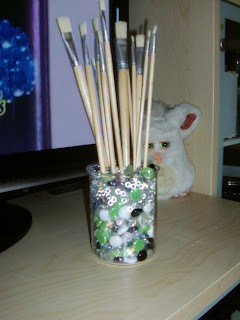 I used one for storing my glass pebbles and it's even doing double duty by also housing my paint brushes! Stay tuned for other ways to recycle these cool containers. What a clever idea... lovely colours of glass beads too.. I love that idea of storing pretty things in beekers.